Because I've heard a lot of great things about Blackbird's, I've been wanting to check it out for some time. So when I found out that a local singer, Suzy Sellout, who by chance happens to work with me was performing there, I took it as a sign and went. Although Dan and I enjoyed the music, the food was mediocre at best. Blackbird's is a welcoming place - from its cheery exterior to its cozy interior. It's very much set up like a bar--a narrow main room with bar seating as well as casual tables surrounding it. The walls are decked with kitchy memorabilia that you'd see at a local bar or even a diner. But the coolest part is that the back is set up for live performances such as the one we saw last night. While the acoustics could be better, it provided a comfortable place to enjoy a good live show--and the best part was that it was free. 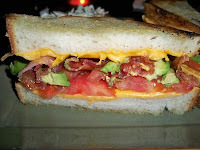 The Avenue Grilled Cheese - Although this sandwich sounded and looked impressive, served on fluffy white Texas toast and stuffed with American cheese, bacon, fresh avocado and tomatoes, it was just mediocre. I thought that the bacon smelled funny and tasted too greasy--it wasn't crunchy enough for me and didn't have that lovely smoky taste. The cheese was a disappointment because it was American - blech. I'm not a fan of artificial processed cheese and this is exactly what it was--Velveeta heaven. The avocado and the tomatoes were yummy though and as fresh as could be. Something else that completely repelled me was my side of slaw. I usually love a good, crunchy slaw but this one was the last scrape of the barrel. Our server literally told me that they "found" some extra slaw before putting it in front of me. The taste and smell was terrible and reminded me of garbage. While my side dish was unacceptable, Dan's fries were delicious and crispy. I should've gotten those. What was I thinking? Beer - We each got a tall glass of beer to wash down our grilled cheese. I ordered the Gruut, a Belgian amber ale while Dan got the Coney Island Lager, considered to be a hybrid beer. I loved the full bodied taste of the Gruut, which was slightly sweet and caramely. Dan's was flavorful as well but more on the bitter side--and he was happy with that. I wasn't thrilled in this area either. Our waiter seemed confused and disorganized. He didn't know the menu very well and was a little too casual with us. We waited about 20 minutes for grilled cheese, which was too long for a simple sandwich. I just didn't understand what the holdup was. Overall, the service definitely needed servicing. The prices were moderate. For two sandwiches and three beers, we paid about $42 including tax and tip. While this wasn't expensive, the fact that I wasn't happy with my experience made me resent it a bit. Hmmm. For what it's worth, I've eaten there several times and never had bad service or bad food. I haven't had the grilled cheese or the slaw specifically though. Gah! Bummer, sorry you had a bad experience there. 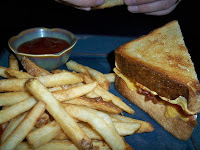 These days I don't eat american cheese, so I am not sure I'd be so into the grilled cheese. I'm a little surprised that they didn't use cheddar or any kind of legit cheese. That bit about "found" slaw is kind of gross. Nice to hear the fries were good. I wonder how their burger is? Yeah, it was a gross experience. I heard that the burger is no better :( Sad but true. Well considering that the grilled cheese is supposed to be their signature dish, I guess every food critic would be curious to try it. Cheers!